This is the first August that I am not away from Budapest in along while... in fact, August marks the first anniversary of this blog, which got its humble start documenting just about everything that Fumie and I ate in Istanbul last August. 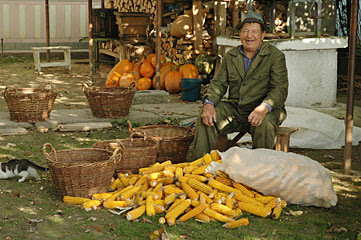 Since I am here, and not there, I'll just dream about where I'd rather be... perhaps in Moldavia? No, not the Republic Of. The Romanian part. All my buddies are over there now, at one of the many festival/teaching camps taking place in the Csángó villages along the Seret River valley south of Bacau. 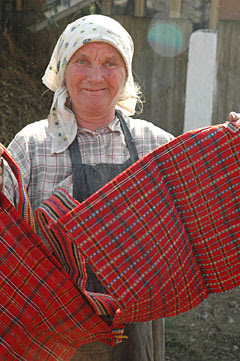 The Csángós are among one of Europe's most stubbornly traditional peasant cultures, the last stronghold of an old self sufficiency that was born out of poverty and isolation, and preserving a rich folklore and unique self identity. 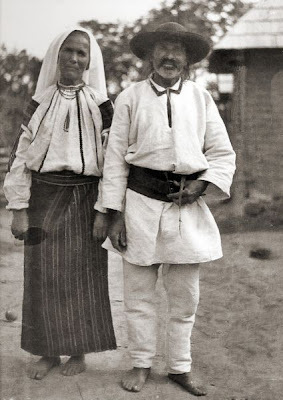 The Csángó (Ceangai in Romanian) are a small ethnic group defined by their Roman Catholic religion in an otherwise Romanian Orthodox dominiated western Moldavia. Most Hungarians would outrightly call them Hungarians, or Csángó-Magyar, but in fact only a minority of Csángós now speak the Hungarian language. 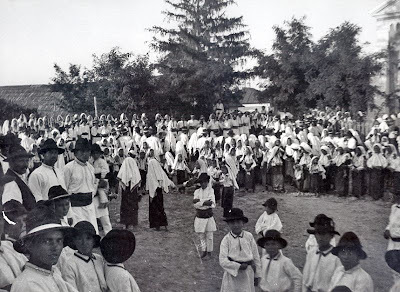 The policy of the Romanian Catholic Church diocese in Iasi has been to send only Romanian speaking priests to Csángó villages, leading to the eventual disuse of the Hungarian language in most Csángó villages. 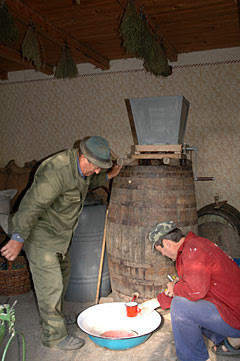 The side effect has been that among these villages some of the oldest Hungarian folk beliefs maintain themselves to this day. The northern Csángó villages such as Saboani/Szabofalva, speak an archaic, nearly medeival dialect of Hungarian, nearly unintelligible to Magyars from other regions. The subject of Csángó identity is a hot one for nationalist types in both Hungary and Romania. some Magyar opinions have them as remnants of the ancient Hungarians who never crossed into Panonnia, leftover Huns from Attia's hordes, or the modern descendants of the old Cuman Turkic tribes. Some Romanian authors claim they are actually Romanians who assimilated into Hungarians in medeival Transylvania and later migrated east. 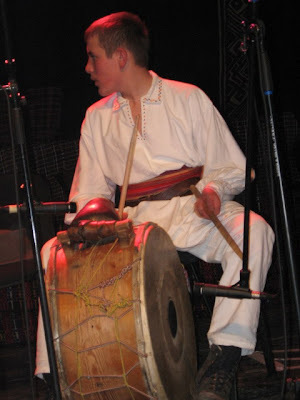 I go with the theory accepted by most ethnologists in Hungary, that the Csángó probably are the descendants of military settlers sent into the region by the Hungarian Kings after the devastation of the Mongol invasions and the destruction of the former Kingdom of Cumania. 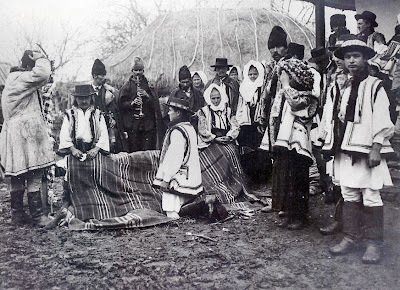 Later, more Magyars came into the region from the Székely regions, as well as Hussites, founding a string of settlements south and west of Bacau. [The following photos were taken by Fumie Suzuki.] Two years ago we were traveling with Australian musicians Pip thompson and Tim Meyen around Romania and decided to drop in on Szabófalva, historically the largest northern Csángó village. Pip wanted to buy some Csángó folk costumes. The way to do this is to drive around the back end of the village looking for old ladies. Since the Csángós, like most Moldavian peasants, live behind high walled fences and are generally suspicious of outsiders, this takes a while. Finally we saw some old women working on the street, so I jumped out and gave a small speech in Romanian: "We are ethnographers from abroad, and we are collecting folk costumes, and as you know, the costumes from this region are the most beautiful in Romania" (at which point everybody agrees...) "And I would like to ask if any of you might know anybody who would be willing to sell us any for cash?" "Well... just wait here..." said one old lady, and sure enough, within a minute everybody had dived into their laundry chests and brought out the old dowry pieces. 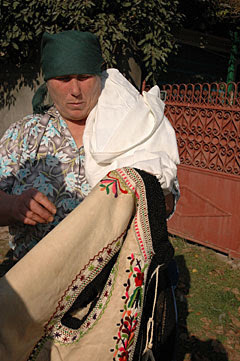 It used to be the custom in Csángó villages to make an entirely new set of dress costumes for each Easter, and then set it aside as a dowry. The younger generation wants more modern weddings, so most older woman have a chest full of weavings and embroidered costumes mothballed away. Old folks don't get many opportunities to pick up extra cash in these remote areas, so soon the street was full of old Csángó women trying to make a sale. i just red your post and i was immedeatly tempted to leave a comment. i'm from szabofalva, not a native, but my parents are. i lived there like 7-8 years, and all my summer vacations in my childhood were spent in there. beautiful time, not only for being a kid but for the simply and still almost medieval live that people had. unfortunetly things had changed since, and all the traditional values are in great danger, espeacially "the secret language". no one use it anymore, except an always reducing number of oldmen; no young man seam to be intrested in it, sad but true. i decided to go back there, to go back home(i now live in italy), and start this beautiful project, a blog in wich i'll try to post daily lessons of csango language as taken from old people. i'll post photos and dialogs and everything i'll encouter related to my ancestors and their culture. Romania is a beautiful country but the people are stupid because is not protect the country from wise guys and keep it clean.Respect. Kelegyest? Where did you get this name? I was born in Pildesti and I never heard this name. 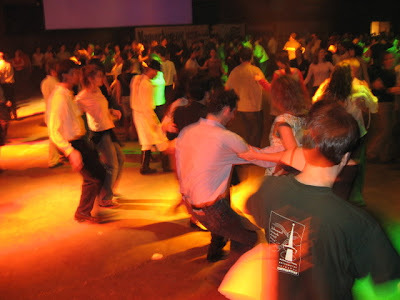 Csángó folklore is identical to Moldovan folklore so don’t even try to make it Hungarian. Half of the people in Sabaoani lost the Csángó language since 1950 but people in Pildesti did not until today.